A study by the University of Oxford concludes that England's migrant population has increased by 565,000 over the past 3 years of which 2/3rds are from the EU. However, in my opinion Oxford University grossly under estimates the number of immigrants as illustrated by the most recent ONS statistics which show a near 300,000 net migration to the UK over just one year, where the total over the past 3 years is near 750,000. So in reality the probable actual increase in migrant population of England and Wales is likely to be about 1/3rd higher than the Oxford University guesstimate. However, here the fatal flaw is NOT taking into account the ILLEGAL immigrant population of approx 800k and including ONS data is likely to be 1 million higher therefore totaling at least 9 million or at least 15.5% of England's population against just 13.4% 3 years ago (2011 census), an huge increase in just 3 years in what is an accelerating trend as the census data for England and Wales from the preceding years illustrates. The bottom line is that Britain's immigration crisis is ACCELERATING and is EXPONENTIAL as my recent article covered the failure of first of the last Labour government that appears to have had an hidden mass immigration agenda of importing nearly 4 million low paid on tax credit benefits with dependants Labour voting vested interests into the country and then the failure of the Conservative Coalition to do anything to control what remains out of control immigration. And remember that the official statistics do not include illegal immigrants totaling at least 800,000, which the Market Oracle Forecasts Include. 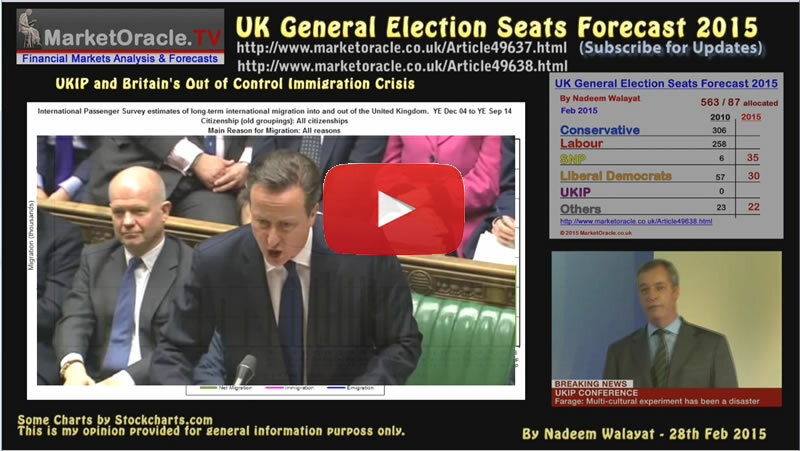 26 Feb 2015 - Will Conservatives Out of Control Immigration Crisis Boost UKIP Election 2015 Prospects? The opinion polls are clearly signaling huge mistrust amongst the electorate for both major parties as voters are not blind to what has been taking place in their towns and cities and thus trust neither major party to form the next government, instead the polls imply convergence towards a truly messy unstable 3 party coalition where the minor party will disproportionately wag the dog, be it the SNP tail to the Labour dog or the UKIP tail to the Conservative dog government for probably no longer than a year before such a government disintegrates. The bottom line is that continuing out of control immigration is not by accident but by design of the last Labour government that during their term in office succeeded in importing over 3 million vested interest Labour voters, whilst signing up to treaties that sabotaged the ability of future governments to bring immigration under control. To imagine that the next weak Labour or Conservative government will be able to control immigration is delusional, especially as Czar Putin's antics in Ukraine ensure a new flood of ILLEGAL eastern european migration is under way with Ukraine the epicentre, let alone LEGAL migration from states on Russia's long border with the EU.